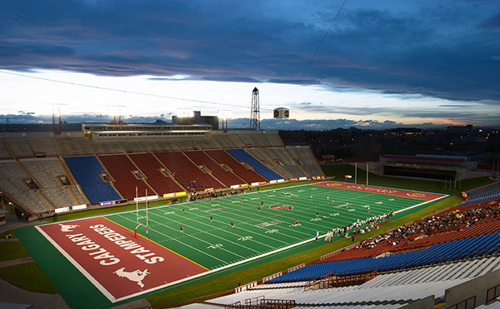 BIG-TIME U.S. COLLEGE FOOTBALL COMING TO CALGARY? 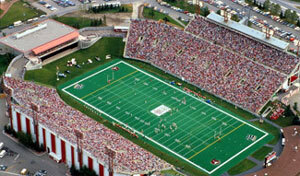 CALGARY - Imagine the Washington Huskies and the Ohio State Buckeyes squaring off at McMahon Stadium. The brain trust at the University of Calgary can. And they've made a formal bid to the National Collegiate Athletic Association to host a game of that magnitude in Cowtown. It would be part of a Calgary Classic weekend that would have two high-profile NCAA Division 1A schools clashing in Canada for the first time in history. 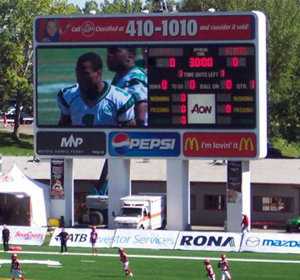 The tentative date for the first annual football extravaganza is Aug. 30, which would be sandwiched between a Calgary Dinos non-conference game two days earlier and the Stampeders annual Labor Day game two days later. "Our interest is in promoting the game of football here in Calgary," said U of C athletic director Bob Corran. "It's a full package of games that has spinoffs for all levels of football." In conjunction with a San Diego based company called Sport Classics Inc., the U of C has forwarded the application to the NCAA head office. The Sport Classics group is fronting the game financially. On Jan. 9, Corran will travel with former CFL commissioner Doug Mitchell and Sport Classics president Dan Hodges to Nashville, Tennessee where they'll make a formal presentation at the NCAA annual convention. With approval, the team selection would be made in early March. There would not be a problem converting the field to dimensions used in the American game. CALGARY - Four tractors and three power sweepers are whisking the white stuff off the McMahon Stadium artificial turf. Up in the stands, 60 or so part-time workers are busy shovelling snow from the seats. And in the Stampeders' locker room, the players are trying to figure out how to outfit themselves for practice to protect against the cold weather and slippery field. Welcome to the CFL in mid-November. Yesterday's 25 cm of snow left the stadium submerged. 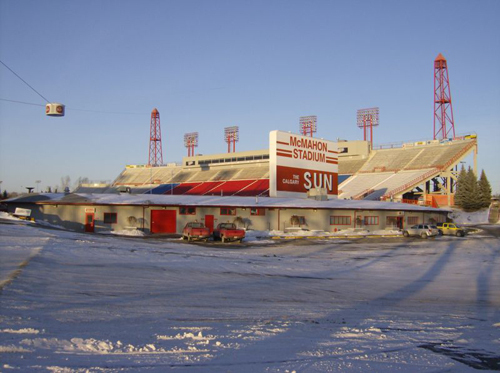 And with the Western Final between the Stamps and Edmonton Eskimos slated for Sunday afternoon, there was an immediate need to dig out. "The point here is we can't let the snow all build and hope to get rid of it all in one day," said Stamps president Stan Schwartz. "Plus, the team needs a reasonably clean field to practise on. I'm sure we'll be removing snow every day until game time." Head coach Wally Buono was amazed at the efficiency of the stadium crew under the direction of Don Phelps. "Don and his crew have been excellent -- it's not easy being here at 6 a.m. removing snow when it's pitch black and freezing cold," Buono said. Stamps and Esks had better get used to this weather - the snow and low temperatures are expected through the weekend. Sunday there's a 60% chance of snow with a temperature between -18 C and -24 C.
"In the last six years we've played in six Western Finals and every one of them has been in very miserable weather conditions," Buono said. "The good thing is that we've been practising the past couple of weeks under all types of weather conditions, so we'll be prepared." The players don't seem concerned, even the first-year Americans. "No way, I never played in snow before in my life," said rookie running back Kelvin Anderson. "But I'll be all right. I'm not having any big problems with footing -- my acceleration is just fine. You might slip a bit, but we'll get that straightened out. "As for the cold, it doesn't bother me." Offensive tackle Fred (Big Chill) Childress, who hails from Little Rock, Arkansas, says it isn't a big deal. "I played in a lot of snow during my NFL days with Cleveland and New England," he said. "You want to see snow -- a couple times in Cleveland we played in a lot more snow than we got here now." First year defensive back Eddie Davis, who played college football at Northern Illinois, added, "I've played in this stuff a few times before where it's been just as bad. I'm used to it but I don't particularly like it." Like it or not, the Stamps and Esks will have to make the best of a cold, slippery situation come Sunday.